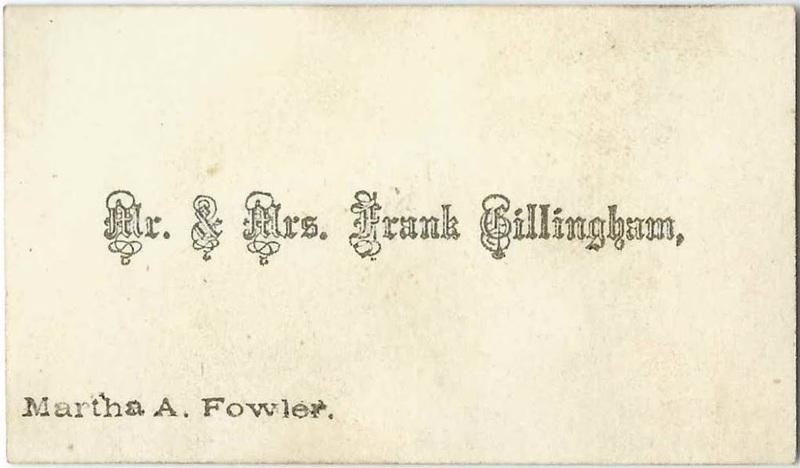 Calling card of Mr. and Mrs. Frank Gillingham, with name of Martha A. Fowler written in lower left corner. They were Benjamin Franklin Gillingham and wife Martha Amariah (Fowler) Gillingham of Newbury, New Hampshire. Benjamin Franklin Gillingham, "Frank", was born August 10, 1843 at Newbury, New Hampshire, the son of Howard Gillingham and Zilpha or Zilphia (Morse) Gillingham. Frank died September 17, 1927, also at Newbury, New Hampshire. Martha Amariah (Fowler) Gillingham was born January 29, 1852 at Newbury, New Hampshire, the daughter of John Cheever Fowler and Martha Jane (Morse) Fowler, according to an entry on page 393 in Genealogy of the Descendants of John White of Wenham and Lancaster, Massachusetts : 1638-1900. Martha died in 1929 at Mansfield, Massachusetts, perhaps while living with her daughter Mary Zipha (Gillingham) Sawyer and husband Frank R. Sawyer. Benjamin Franklin Gillingham, "Frank", and Martha Amariah (Fowler) were married at Concord, New Hampshire, on January 9, 1874 and farmed at Newbury, New Hampshire, where they raised at least two children, John and Mary Zilpha.